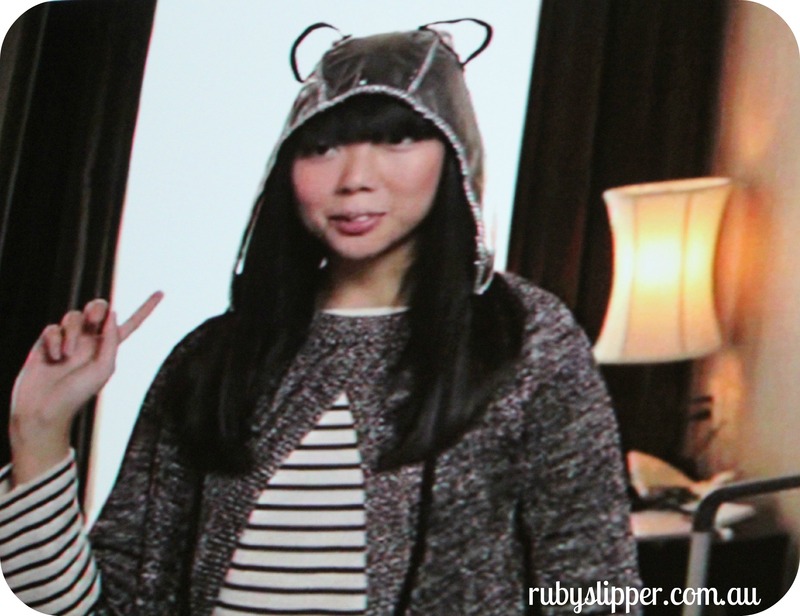 On Friday Ruby Assembly attended Portable’s presentation of Susie Bubble (inset above wearing dashing rainhat/animal ear combo), famous internationally for her blog Style Bubble. 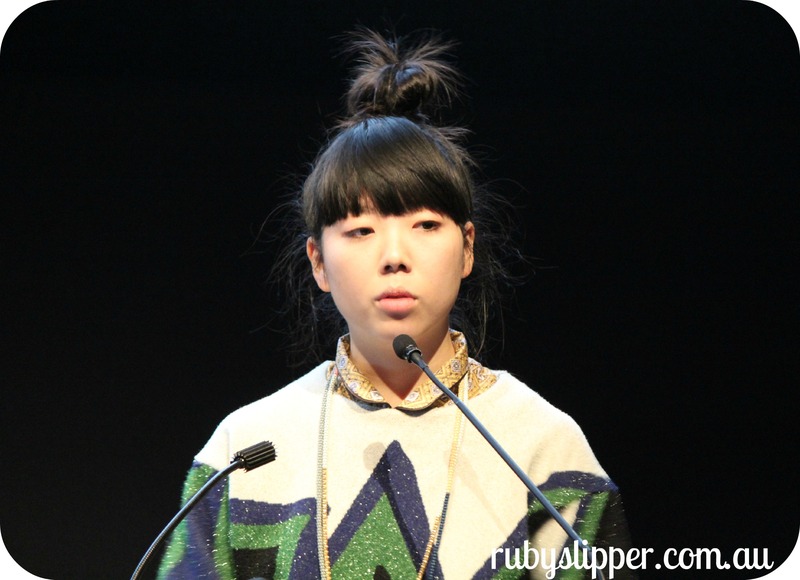 To be honest, I hadn’t really delved into the world of Miss Bubble prior to hearing her speak. I was worried that the discussion would be another surface-level conversation about the importance of non-traditional media and ways that aspiring bloggers could monetise their weekend blogs. I’m pleased to say I was wrong! 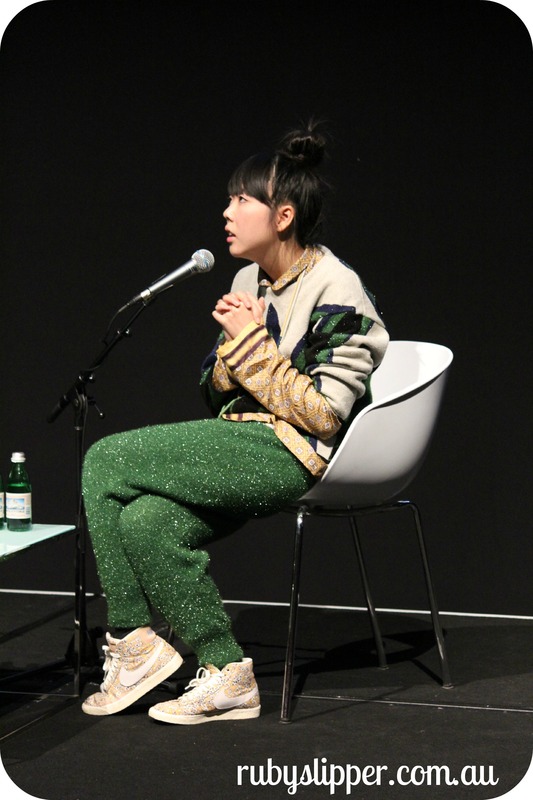 Today’s blog covers off on some of the core concepts that Susie spoke on, and features some nifty pictures of her shiny green tracksuit which I found quiet fetching. My how the face (and respectability) of online content creation has changed. A mere five years ago who’d have thought that whole professional careers could be based upon online publishing and blogger collaboration? Warm, engaging and with mellifluous trendy-Brit tones, Susie began her discussion by mentioning new TV zeitgeist ‘Girls’, where the lives of twenty-something female New Yorkers are put under the microscope (sound familiar?). In it, one of the girls’ parents tries to set her straight on the career path, quipping ‘Why don’t you just get a job and start a blog! ?’ These kinds of pop-culture comments are a sure sign that blogging is a form of media and self-expression that is here to stay, and is ostensibly validated by the wider community. Susie began her blog back in 2006 and was influenced by Style Bytes, Fashionologie and Diane Pernet’s A Shaded View on Fashion. At the time, she was in an uninspiring digital marketing job. Susie wanted to explore her own tastes in fashion through Style Bubble, using herself as a ‘dummy model’ to experiment style upon. 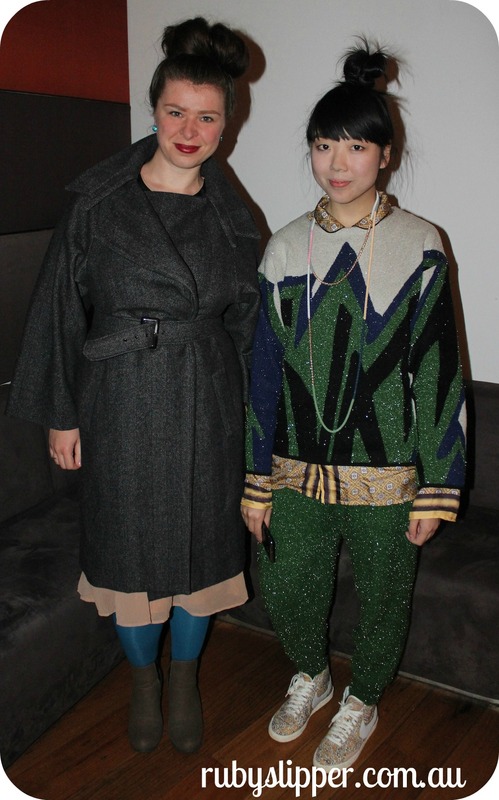 Susie has a range of content on her site – a little street style, journalistic documentation of the craft of fashion (eg. visiting the makers of Harris Tweed which like champagne must be created with a certain process in a geographic location to be called so) and uncovering new talent to the wider market. Susie says that natural growth and organic promotion created the initial popularity around her work. Susie had a refreshing view on the perceived ‘popularity’ and influence of a blog. Many brands and PR agencies look solely to traffic when considering whether or not to market or work with a blogger. Susie makes clear that site traffic doesn’t always mean quality of audience or measure of influence. Susie gives the example of her work with jeweller Jessica Dance whom she featured as an ‘undiscovered’ talent. The actual blog may not have had huge readership, but Jessica went on to collaborate with Mulberry who picked her up from Susie’s post. It’s quality of content and readership versus quantity of blogs and hits. Susie also spoke about the wide diversity of blogs in circulation. There’s personal style like Fashiontoast and The Man Repeller. There’s street style like Jak and Jill. Then there’s fashion news coverage sites such as Fashionising which use teams of contributors for their content. Singular voices also have their place – think Anna Della Russo and Bryanboy. Susie identifies that PR and advertising/marketing departments needs to work out how these different blogger elements fit to create excitement around their own brands. Fashion blogging is now in a state of ‘semi-acceptance’ in the wider fashion industry. Fashion blogging has been variously accepted, celebrated and vilified. The positives are that bloggers have been co-opted, and are seen as a part of fashion media and marketing. An example of such acceptance was Susie’s 2007 invitation to Chanel to see the making of Chanel perfumes, and Coco’s apartment. This shows a clarity of forethought from the established fashion house and a legitimization of the role of the blogger in marketing premium identities. The occasional negative response to blogging is the perception by traditional media that bloggers are interlopers. Susie makes clear that creating content for a fashion blog doesn’t begin and end with a fashion week. Now there is now a crossover of content between blogger websites and traditional print media, and further cross-pollination has occurred with editors are becoming respected bloggers such as Anna Della Russo. Susie didn’t shy away from tough questions – including the thorny ‘are bloggers journalists’? She thinks that journalism and blogging are two different kinds of activities with different motivations. Bloggers are free agents (in principle) where as journalists are being paid by a media house. Such freedom of expression can be confronting for traditional media, but this freedom of revelation and self-expression is at the core of blogging – its very currency. Susie noted that journalists are critical and exploratory, whereas bloggers are usually analytical – they’re experiencing something for themselves in the first person. Bloggers who know their stuff – Calvin of Vanity Press and Sarah from Sarah’s Style Emporium. Susie also discussed the blog as brand. Bloggers do a range of things to monetise their work – from their actual research and photography content through to appearances at events and collaborations with fashion houses. Susie is considering a pop-up shop in future as an extension of her own brand. In the past, Susie has worked with brands including Prada, Top Shop, Galleries Lafayette, Dr. Martens, GAP, Dior, Valentino, Nike and Selfridges – some of which she says has worked brilliantly, and some of which has been difficult to reconcile. For Susie, the way her readers feel about her collaborations is important – her content needs to be in line with her values. All bloggers must remember – there’s no free lunches! Think twice about accepting everything you are offered as ‘gifts’. Looky here! It’s yours truly with Susie Bubble. Susie wonders how long the blogger as ‘jack of all trades, master of none’ is sustainable. In order for her work to continue, she regularly lends her talent across a range of disciplines. Of import is understanding your place and context and knowing your blog. Credibility can be difficult to balance with the imperative of monetization. Blank promotion isn’t really content – and content is what your readers appreciate. If you’re going to cross-promote with a brand, do so in an intelligent way that is coherent with your own blog. At core, blog for the love of it, and enjoy the creation and curation of your content. No longer a phenomenon, blogging is an established contributor to the world of media. 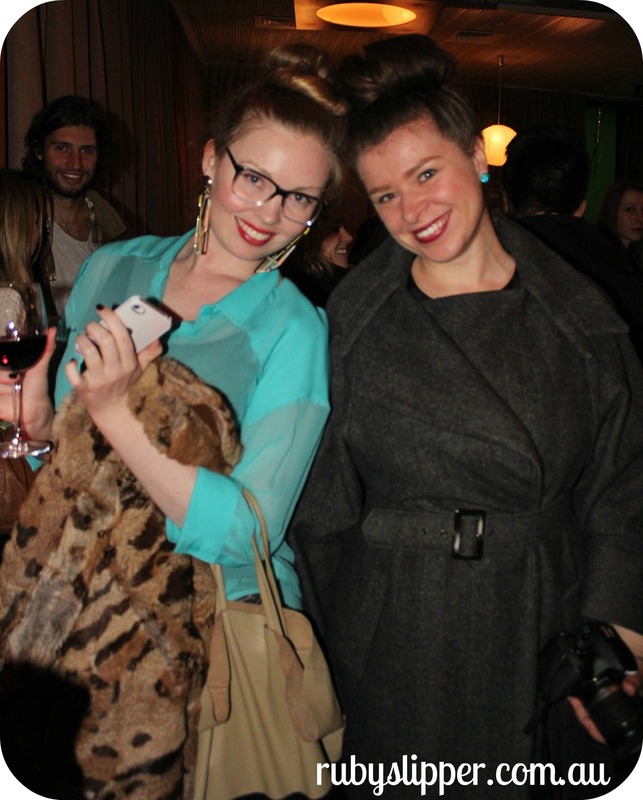 Both with Susie Bubble top-knots: Kyra from Pybus PR and myself.